Categories: A BIT OF EVERYTHING, FREE ABC SCRIPTURE CARDS, LAUGH WITH ME, SCRIPTURE CARDS and FREE SCRIPTURE eCARDS | Tags: free Scripture Card - O -, free soil, Psalm 34:8, The LORD is good | Permalink. What is the Feast of Weeks? I asked Google. Thank you Google! Tomorrow will be the biblical Feast of Weeks for all of us who accept invitations and commandments from our Creator and Father. How do I know? Because His Holy Word tells me so. Thank you Bible Gateway! How do Jewish people celebrate the Feast of Weeks or Shavuot? One of my favourite biblical scholars, Nehemia Gordon, tells us that ‘Shavuot is a pilgrimage-feast, in Hebrew chag. 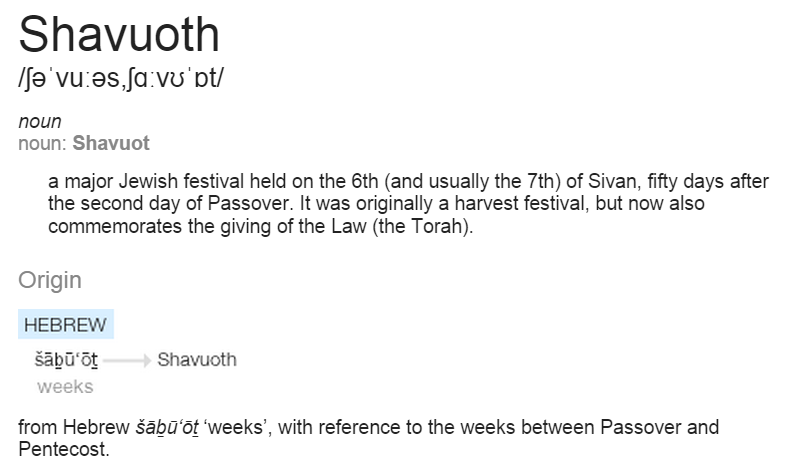 As a chag, Shavuot is one of the three annual biblical festivals on which every male Israelite is commanded to make a pilgrimage to the Temple.’ Nehemia then continues to explain in depth what Shavuot is all about on his website Nehemia’s Wall in an article called The Truth About Shavuot. As an aside, there is no temple today to make a pilgrimage to. More about that later. More info still on the Wikepedia site. Thank you Wikepedia! Should or shouldn’t we celebrate Shavuot? I’ve heard ‘Christian’ people say that they don’t feel it is necessary to celebrate any of the Feasts after Jesus’ crucifixion. And I’ve heard ‘Jewish’ people say that because there is no temple there is nowhere to celebrate or give the sacrifices. I also hear Bible students say that only males are to celebrate these Feasts and that God doesn’t like sacrifices. ‘Being Jewish’ explains ‘Why we do no longer bring animal sacrifices’ and why we cannot bring sacrifices without a temple. Christianity stack exchange explains where in the bible it says that sacrifice can only be done in the temple. And I collected a stack of Scripture references where the Lord in no uncertain terms expresses his displeasure with the sacrifices. Accept the invite or decline? The excuses given for not showing up to the party remind me of the wedding party story. In a nutshell: The King invites guests to his party and everyone has an excuse. All the initial guests end up in a bad place and a whole new crowd is being invited. Guess what? It appears that only those not wearing the right wedding garment are kicked out. Sure you can decline and sure you can have an excuse. No doubt a very legitimate excuse too, just like the guests who couldn’t make it to the wedding and declined the invitation. But when my Creator invites me, I brush up and I show up. And everyone else can do whatever their heart tells them to. On this occasion we are to bring a gift (freewill offering). You can read about my favourite charity here. I’ve been told that Feed the Hungry.org provides one hundred meals to hungry kids for six bucks only! It’s the best value around. And not only that but 100% of donated funds ends up with the kids because all services such as transport as well as all food and administrative work are donated by volunteers. To argue that we’re not to bring a freewill offering during this Feast strikes me as a bit, dare I say it? Pharisaical maybe? The timing of this Feast coincides with the giving of the Law so what better time to commemorate the giving of the Law? A Pact of Love as far as I’m concerned. So here goes once more. and rested the seventh day: wherefore the Lord blessed the sabbath day, and hallowed it. Categories: A BIT OF EVERYTHING, GOD'S HOLY FEASTS, LIVE FOREVER | Tags: Biblical Feasts, Book of Ruth, Celebrate with me, Christian Feasts, Feast of Weeks, feedthehungrydotorg, holy convocation, Jewish Feasts, Shavuot, statute for ever, The Commandments a Pact of Love, Who is a Jew? | Permalink. In one of my past lives as a child, my parents owned a beach shop in Hoek van Holland and I helped them in our shop and grew up on the beach. Apart from all the ordinary mayhem, I had a wonderful childhood and my Mum was there for us always, we were very blessed. Neither of my parents was overly ambitious, both were happy to take each day as it comes and just to raise their kids. Later on in my life as a wife to a medico, I managed the medical centres which we owned and this was an extremely stressful and hectic life. Neither one of us did this for the money. My husband as a doctor simply did what he did best and I as the wife helped out where I could. Because of our position, money flew in readily and out just as easily. When my health crashed spectacularly I sought out the Lord with all my soul and all my heart and all my might. Cheap isn’t it? Only when I was down did I get back to my roots and prayed my heart out. This is when I learned that unless the Lord build the house, they labour in vain that build it. I never actively pursued money. In fact I chose to be there for my kids like my Mum was there for my brothers and sisters and I. This meant that I had a full-time job managing our clinics at the same time as being a full-time Mum educating our kids myself. This no doubt contributed to my crumbling health. What I learned during the dark times is that no-one can perform two full-time jobs at the same time. I tried and I did and eventually I failed and paid for this dearly with my health. 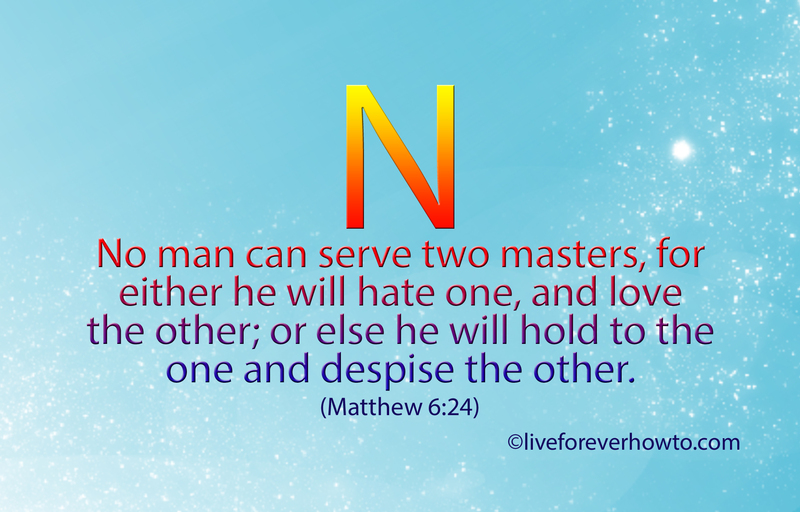 Even though I was not pursuing wealth I was serving not two but three masters. My husband, our clinics and my children and all pretty much 24/7. With God there is hope however and what He says always works in my life. O Lord my God, I cried unto thee, and thou hast healed me. I learned that I had my loyalties mixed up and nowadays I run everything past my Creator before I commit to anything. If you find yourself playing catch-up from dawn to dusk, have a quiet moment and ask yourself, ‘Who are you serving?’ and ‘Is this who you want to be serving?’ Do you have love, peace and balance in your life? Categories: A BIT OF EVERYTHING, FREE ABC SCRIPTURE CARDS, LIVE FOREVER, SCRIPTURE CARDS and FREE SCRIPTURE eCARDS | Tags: Don't worry about tomorrow, Kingdom of God, Matthew 6:24, No man can serve two masters, Seek the Kingdom of God | Permalink. 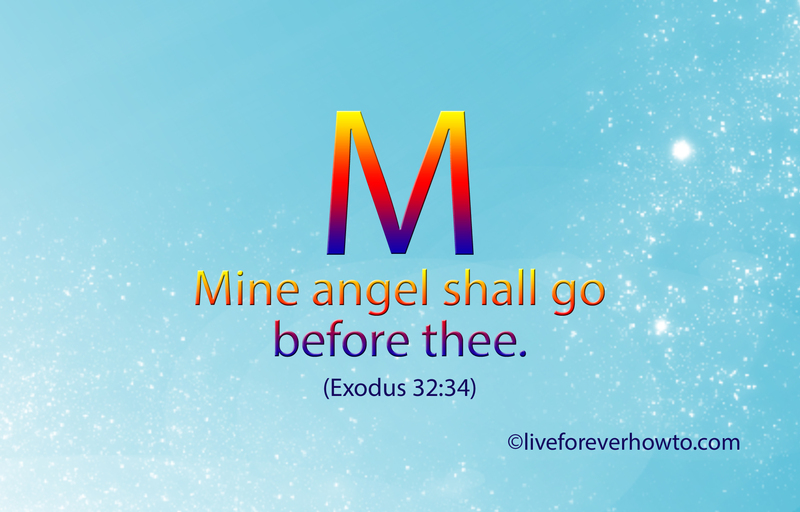 Categories: A BIT OF EVERYTHING, FREE ABC SCRIPTURE CARDS, SCRIPTURE CARDS and FREE SCRIPTURE eCARDS, SONGS and VIDEOS | Tags: Angel of the Lord, Angel song, are angels real?, I like angels, share your angel story | Permalink. Categories: A BIT OF EVERYTHING, FREE ABC SCRIPTURE CARDS, SCRIPTURE CARDS and FREE SCRIPTURE eCARDS, WHAT IS LOVE? 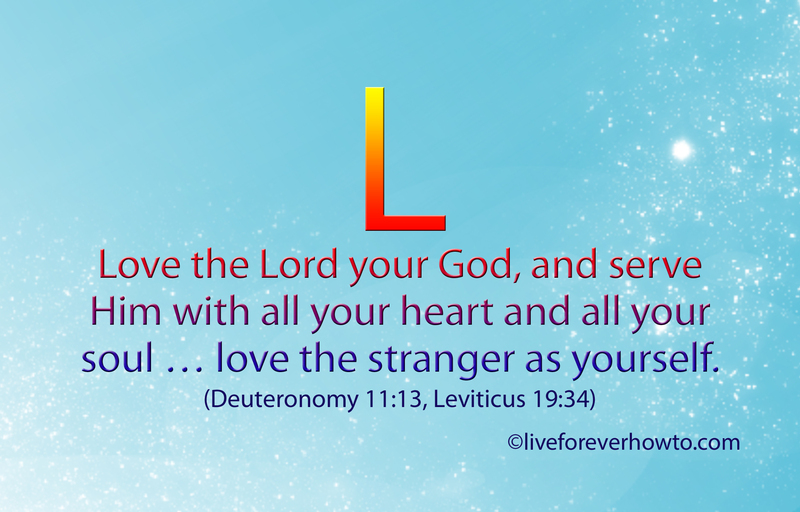 | Tags: Commanded to love each other, Deuteronomy 11, Leviticus 19, Love the LORD, Love the stranger, SBS, Struggle Street documentary, Triple M Mark Geyer | Permalink. 1. Knock and it shall be opened unto you. 2. Trust in the LORD and His Son. 4. Promises made in Psalms. 5. Promises made by prophet Isaiah. 6. Promises made by prophet Jeremiah. 7. Promise made by prophet Amos. 8. Jesus reiterated what the prophets said. 9. Promises made by Jesus. 10. So what else did Jesus say? 12. The full promise made by Jesus as partially quoted on the Scripture Card. A little while ago I told you how we prayed for a place we could afford and where pets are allowed. I mentioned also how New Age positive thinking doesn’t work for me because it lacks the faith component. In contrast I like the promises made in the Bible and by the Son of God because of the proven track record. There have been so many fulfilled promises in my life that I’ve pretty much lost track of a lot of them but I certainly remember all the big ones including the ‘upgrade in residential comforts,’ because I enjoy these comforts every single day. There were a lot of factors that came into play for this promise to be fulfilled, such as right time, place, residence, fine friends giving appropriate references, receptive and kind landlord and so on. Soon after a family member as well as a very kind ‘health professional’ friend offered us accommodation. When we arrived in our new town there were offers for rentals ‘free for the first month’ and so on. We had faith, we committed all to Our Father and we trusted that everything would work out well and, Praise The LORD, things worked out really well for us. Trust in THE LORD and His SON. When Jesus gave his famous sermon on the mount he told his listeners that if we knock, it shall be opened unto us. But this wasn’t all he had to say about this wonderful promise. There was plenty more. And I wonder if other prophets said a similar thing. After all Jesus, as a Jewish prophet, taught from the old Scriptures. Let’s have a look to see who else told us about this promise. 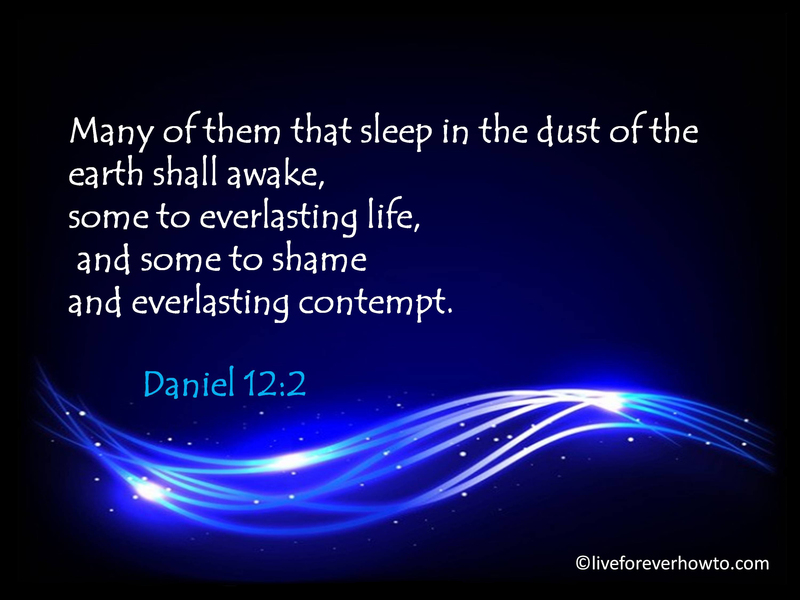 The following verses are, apart from one, all credited to King David. King David mucked up plenty times but he was confident, that as long as he repented and continued to commit to and trust in the LORD, GOD would hear him. no matter what his situation or his failures, David would always eventually turn to the LORD for repentance and forgiveness and strength to keep on going despite his failures and inadeqacies. Asaph, with his verses from Psalms, contrasted the trust and commitment shown by King David with the nonchalance and entitlement of the (wicked) pretenders and hypocrites. As a King, David was rich with many servants and resources, yet his trust and strength was always in God and not in his wealth nor in men. Prophet Isaiah taught that we should always seek God who will abundantly forgive anyone who is genuinely remorseful. Till I read the Ten Commandments I didn’t even realise what I had to be remorseful for. This had much to do with the circles I used to move in and the fact that western societies celebrate covetousness. Around the concepts of stealing and lying there were many blurred lines in my life. And what about honouring your parents, sure I was nice to them, but ‘honouring’ them? What? Honour God and Go(o)d alone. Huh? I used to mix all religions and thought this was a smart thing to do. Swearing … why not? Doesn’t everyone? And hating is akin to killing? Oops. When I started to read the bible and I came across the word wicked I initially thought this meant murderers and the like. It wasn’t till later that I realised that the pretenders and hypocrites were referred to as ‘the wicked’ as opposed to those who make a genuine effort to do the right thing according to the guidelines set by our Holy Father. Reading the Commandments made me realise that it is a good thing to follow my gut instinct over and above society’s norms and guidelines and peer pressure. So, yes I have plenty to be remorseful about. The Commandments are literally a godsend to me because they are transparent, easy to follow and set a universal standard for human morality and decency. Prophet Jeremiah prophesises that when people look for God, they will find Him; with mighty promises attached for doing so. Prophet Amos says that seeking God assures life. 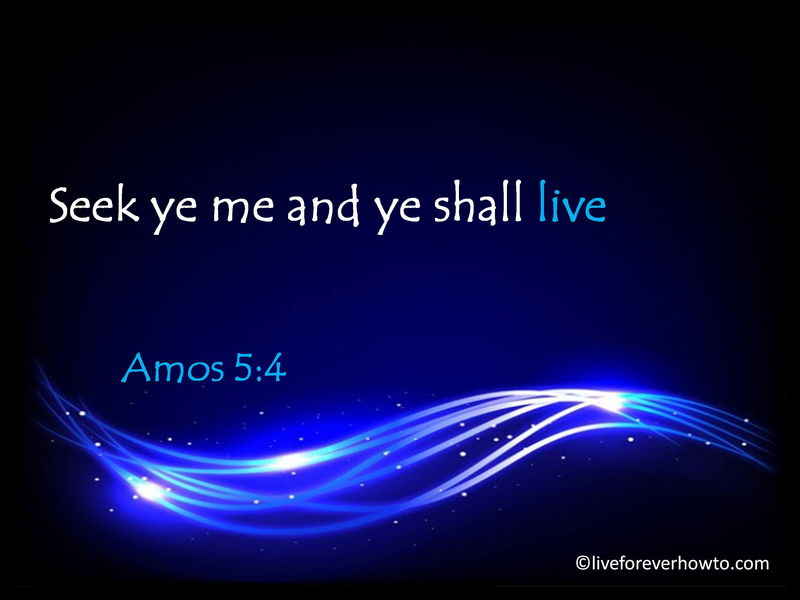 Prophet Amos makes the connection of seeking THE LORD with eternal life. As we can see above from the quotes by the prophets, what Jesus said was nothing new and He merely reiterated what the prophets had been saying all along. The above scriptural references made by the prophets of old was likely the kind of text that Jesus quoted from. I am only quoting a few references here; there are plenty more quotes in GOD’S Holy Word about seeking Him and how to go about it to get marvellous results. After reading all these promises I can see a pattern emerge and some kind of formula appear. 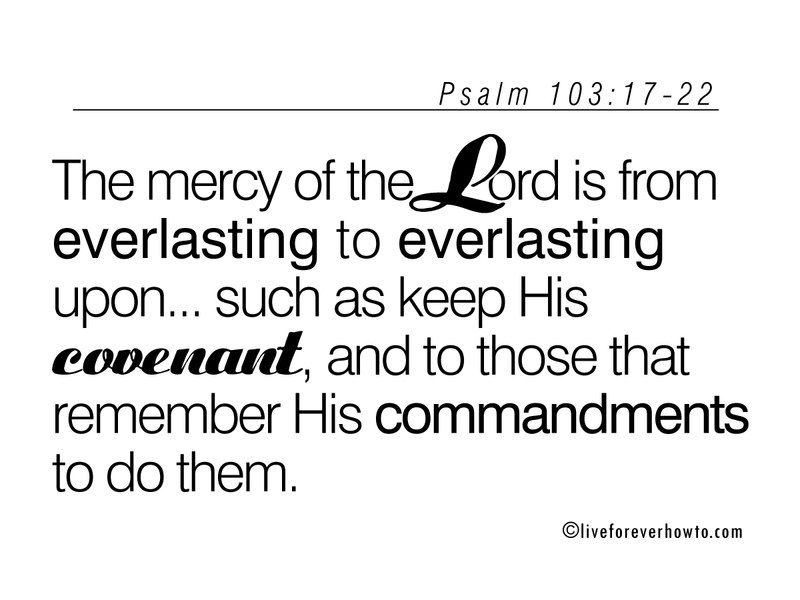 It is good to keep in mind that the promises are made to followers of Yehovah and His Son. And we should also remember that any of us at any time can choose to be part of God’s posse. Faithful believers who make a genuine effort to do all the right things can expect good results when they apply the teachings from the Holy Word and live by the rules which are set by the Creator of our universe. Applying ‘positive thinking’ without the ‘faith component’ does not work for me. It may work for others. But for me, life is more about the intimate relationship I have with my Creator and His Son than it is about ‘wanting this and/or wanting that.’ Anything that flows from the relationship I have is an extra, a bonus and very much welcomed and graciously accepted. But these extra’s and bonuses are certainly not what motivates me. So what else did Jesus say? Jesus said, if you remain true to me, I’ll be true to you. 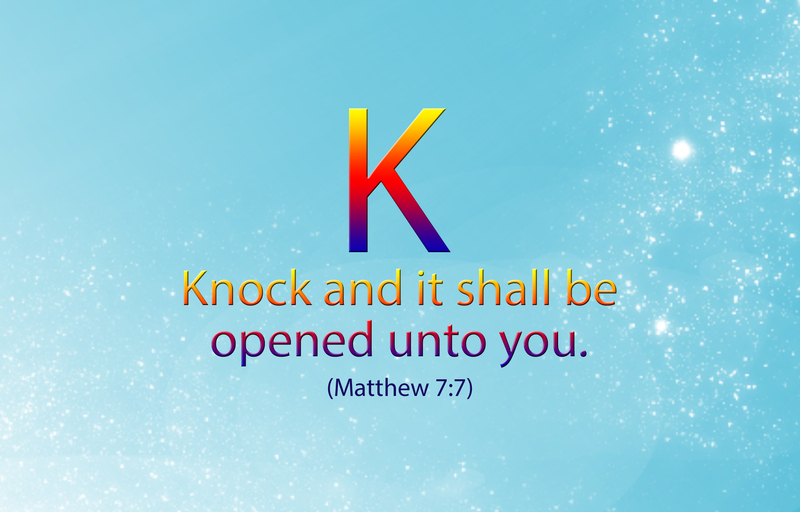 The ‘Knock and it shall be opened unto you’ promise is well known and no secret at all. But few people realise that there are many components to this promise that need to be heeded if we want a positive result. Some people think that it is possible to get something for nothing but as we just read, if we want a positive response when relying on this promise we need to make sure that we do our part to the best of our ability. What is our part? The above verses tell us to trust, commit, call, seek and ask humbly. We’re told to do good and call upon Him in truth with all our heart. If necessary return to Him, if possible be in agreement with your nearest and dearest. Keep His words and commandments and ask according to His will. We’re told to pray and to believe. There is a minimum of sixteen steps to this formula. 9. With all our heart. 10. If necessary, return to Him. 11. Be in agreement with nearest and dearest. 14. Ask according to His will. As you can see, there are many components to the knock-and-you-shall-find promise. If you have been knocking for a while with limited results maybe check if all the boxes are ticked before you start banging that door down. Categories: A BIT OF EVERYTHING, FREE ABC SCRIPTURE CARDS, LAUGH WITH ME, PROMISES AND PROPHESIES, SCRIPTURE CARDS and FREE SCRIPTURE eCARDS | Tags: ask and you shall be given, Formula for fulfilled promises, Free Scripture card - K -, King David, knock and it will be opened, Popular beliefs about heaven, Promises, promises by Jesus, promises by the prophets, promises from the Bible, prophet Isaiah, seek and ye shall find, sola scriptura | Permalink. Categories: A BIT OF EVERYTHING, LIVE FOREVER | Tags: Allen S Maller, Chabad.org, Daniel 12:2, Jewish author Tracey Rich, Jewish Bible.org, Judaism 101, Keith Johnson BFA, live for ever, Nehemia Gordon, Olam Haba, Rabbbi Tzvi Freeman, Rabbi Evan Moffic, Torah with 70 different faces | Permalink.